Ahi tuna tempura lollipop with brûléed soft egg, bean potato salad and olive tapenade. Recipe by Chef Damien Tirego of Crabby’s Seafood Bar & Grill. Serves 4. Best paired with Charles Smith Kung Fu Girl Riesling. Recipe by Chef Damien Tirego of Crabby’s Seafood Bar & Grill. Mix all ingredients except tuna thoroughly in a medium mixing bowl. Roll tuna skewers in the batter. Heat oil to 350°F. Swirl lollipop into the oil for about 15 seconds until the breading sears. This will help keep it from sticking. Drop lollipop into oil and fry for 2½ to 3 minutes. Remove from oil. To serve, place the tuna lollipop on the left side of a rectangular plate. Top with olive tapenade. 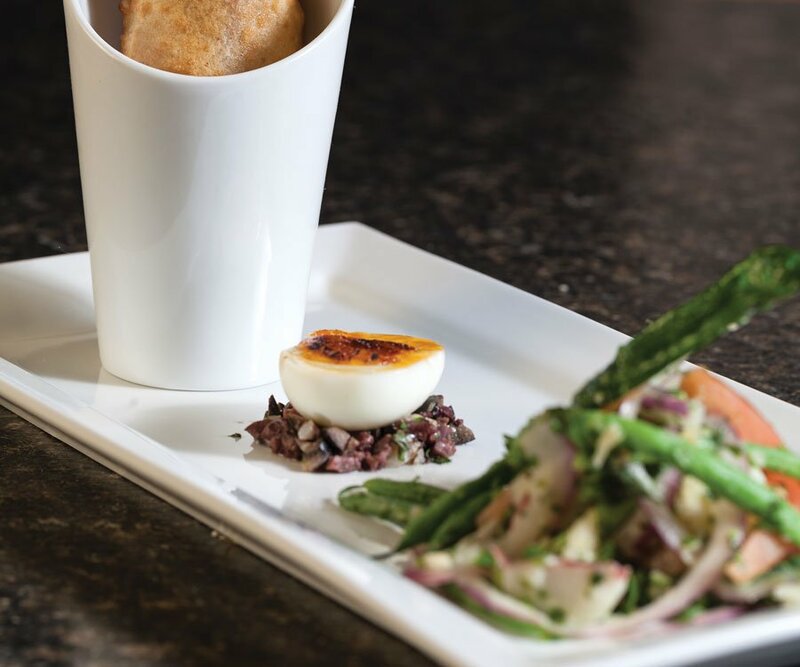 Place brûléed eggs in the center of the plate and a 2- to 3-ounce portion of the bean and potato salad on the right. Boil eggs for no longer than seven minutes. Remove and place into cold water bath. Set for 20 minutes. Remove shells and gently slice in half. The yolk should be gelatinous. Top with a pinch of kosher salt. Lightly top eggs with sugars. Caramelize with a kitchen torch until brown. Whisk Dijon mustard, rice wine vinegar, sugar, Sriracha and tarragon leaves in a mixing bowl. Slowly add olive oil while whisking to create an emulsion. Toss in red potatoes, haricot vert, tomatoes, onions and carrots until thoroughly mixed. Place all ingredients in a food processor and pulse until coarsely chopped.